T-Mobile has announced that 42 markets have received an upgrade to their HSPA+ 42 network today. Back in May the company announced that an additional 55 markets would be getting upgraded, but those are in addition to the lucky cities that are already seeing it happen this morning. 4G Smartphones: the Galaxy S 4G, the T-Mobile myTouch 4G, the T-Mobile G2, the T-Mobile Sidekick 4G, the T-Mobile G2x with Google, HTC Sensation 4G and the upcoming BlackBerry Bold 9900. 4G Tablets: the Dell Streak 7 and the T-Mobile G-Slate by LG. 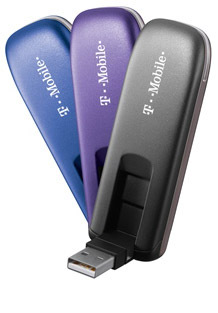 4G Laptop Sticks: the T-Mobile Rocket 3.0, T-Mobile’s first HSPA+ 42-capable device, the Rocket 2.0, T-Mobile’s first HSPA+ 21-capable device, the T-Mobile Jet 2.0 and the prepaid T-Mobile Rocket 4G. Of course, as with all broadband mobile speeds, these are “theoretical” speeds, meaning the likelihood of you actually hitting 42 Mbps are fairly low, but you should still see some pretty significant speeds when you are out and about doing … well … mobile things. The 41 additional cities added today brings the total to 96 with more to come this year. Have you gotten to experience the increased speeds yet? How were they? UPDATED: A total of 41 additional cities were rolled out today, not the 42 that were originally reported, bringing the total to 96.